Angiotensin II (AII) is a powerful agent in the regulation of renal functions, and possesses its receptor(s) within the kidney. The second messenger of AII is considered to be Ca++. 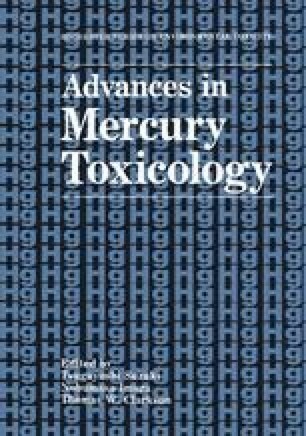 Since mercuric chloride is one of nephrotoxic heavy metals, its effects on All-mediated signal transduction have been investigated. Rat kidneys were treated with collagenase, and microdissection was made for isolating defined nephron segments. [Ca++]i was determined using fluorescent indicator fura-2. In the freshly isolated early proximal tubule (S1), All-induced [Ca++]i rise was biphasic, demonstrating the two peaks corresponding to the 10−11 and 10−7M. HgCl2 (10−10 – 10−8M) potentiated the [Ca++]i increase induced by AII (10−11M) in a dose dependent manner, up to the 10−9M HgCl2. A similar effect was observed with methylmercury. To determine the mechanism of stimulatory effect of HgCl2 on 10−11M AII-induced [Ca++]i increase, nephron segments were pretreated with propranolol (10−4M), a PLC inhibitor. This stimulatory effect of HgCl2 was completely inhibited by propranolol. Moreover, 10−4M propranolol completely blocked the stimulatory effect of HgCl2 on AII-mediated inositol 1,4,5-triphosphate (IP3) production. This study suggests for the first time that mercurial compounds stimulates the [Ca++]i increment induced by AII, possibly through an activation of phospholipase C (PLC).